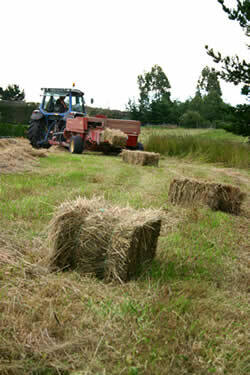 A study by a horse advocacy group has found that levels of neglect rise with the price of hay. The Equine Welfare Alliance today released a statistical study on the rates of equine abuse and neglect across the United States since 2000. The research examined equine abuse statistics from Colorado, Georgia, Idaho, Illinois, Maine and Oregon. Historical records of the number of cases of equine abuse and neglect from these states were correlated with three potential causes: the rate of equine slaughter, unemployment and the cost of hay. Surprisingly, the researchers found that the rate of abuse has been in decline in four of the six states since 2008. Five of the six states had shown a spike in abuse and neglect around 2008 and two showed a significant increase in the past two years. The dominant factor the analysis produced in every state was the price of hay. “My assumption was always that unemployment was the dominant factor,” admitted alliance president John Holland. The analysis showed the second most important correlation was the rate of slaughter, but the analysis found more slaughter consistently correlated with more abuse and neglect. The American Veterinary Medical Association (AVMA) and the American Quarter Horse Association (AQHA) have long urged Congress not to ban horse slaughter on the basis that to do so would increase abandonment, abuse and neglect. The alliance study follows on the heels of a peer-reviewed paper in the Kentucky Journal of Equine, Agricultural, and Natural Resources Law by Holland and Laura Allen, of the Animal Law Coalition. That paper documented enormous increases in the cost of horse ownership between 2000 and 2011. The paper demonstrates, among other pressures, that a shift of land use from hay to corn for ethanol has reduced the hay available to horse owners, cattlemen and dairy farmers. Severe drought in some states has made an already insufficient supply of hay all but collapse. In 2011, Congress ended the long-standing subsidy for ethanol in gasoline and removed tariffs on sugar cane. The alliance hopes this will put a downward pressure on hay prices in coming years. The hay pricez were controlled by ag which is pro slaughter. So its the old choke the wallet game. As for abuse and neglect, it was started with the first slaughterplant closed in us in the 1970 s a review of animals stockpiled.for slaughter which had widespread strangles outbreak was discovered, the first horse rescue opened to save those first horses locate. Since then neglect became a normal sidebar of slaughter…..as it was discovered the neglect and abuse increased in the 80 s as the goog ol boy just slaughter it came into play. What pro slaughter does not say is the plants in texas and illinois were the only ones left in us because thd others were closed down in the late 80s due to widespread abuse and neglsct. The plants remaining in the us processed healthy animals, sometimes upwards of 15,000 stolen animals per year. Again good old boy syndrome kept them in play, until the public was awakened. Now they claim closing plants caused neglect when in fact almost all rescues opened for horses from 1970 through 1998 most all predating the closure of us slaughter. So dont fallfor their propaganda, if slaughter answered their problems, then why were there people having horses seized from 1971 through 2006 in record numbers? They have their data backwards. My favorite seizure of horses happened in 1989….a now defunct horse breeder had raisedAQHA horses on their farm in 1989 during a divorce nearly 300 starving animals, sadly 47 dead. By favorite i mean since aqha is the conductor of the train they should have seen their caboose starving animals. They know and instead of saying they should stop the crime they say kill the horses. There was no drought,hay shortage or slaughter houses closed, they still intentionally starved them because of an arguement of divorce.